To anyone who is intimidated by cooking an entire chicken, stop! Yes, it may seem strange to cook the entire chicken, rather than have each piece pre-cut for you. Sure, boneless-skinless chicken breast is healthy, but when chicken is cooked in its entirety, with skin and bones, white meat and dark meat, the result is incredibly tasty and aromatic. AND INCREDIBLY EASY! So easy it shouldn't be allowed, like you're cheating somehow. Plus, your kitchen will smell like it's a holiday, but really it will just be Sunday. That's my favorite day to roast a chicken, so I have leftovers to last me through the week. After I cook the chicken and eat some for dinner that night, I cut off the rest of the meat and save it for lunches and quick dinners throughout the week. Of course, there are a plethora of recipes that utilize leftover chicken, but you don't even have to go that far. Eat it plain, put it on a salad, a sandwich, or make chicken salad. Super easy. 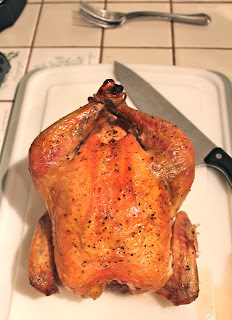 This is a basic recipe for roasting a chicken, a good starting place, but it's infinitely adaptable. I have yet to branch out though, because this version is so delicious I just haven't felt the need to change it! To start, line a large roasting pan (I use a 13 x 9 baking pan) with aluminum foil and spray it with cooking spray. Prepare the chicken by first removing the giblets - extra parts of the chicken stored in a little bag in the cavity of the chicken. Depending on where you buy the chicken, the giblets may have already been removed (Whole Foods removes them but Costco does not, for example). Next, rinse the chicken under cold water and pat it dry with paper towels. Place it in the roasting pan. And wash your hands frequently throughout the process, please. This is a perfect instance in which you should do as I say and not as I do. There should really be a couple of inches on each side of the chicken, so make sure you use a big enough pan. Now pour a few tablespoons of olive oil over the chicken and spread it around with your hands. Next, generously sprinkle salt and pepper over the entire chicken. Now you're going to stuff some aromatics into the cavity of the bird. This recipe calls for garlic and lemon. Take a whole head of garlic (or as much garlic as you have on hand, if you don't have an entire head - it still works) and cut it in half crosswise, so the each clove is cut down the middle. Cut a whole lemon in quarters. Stuff as much garlic and lemon into the cavity as will fit. To avoid burning, you need to tie the legs together. This also holds in the aromatics. Cut a few inches of kitchen twine (which you should be able to find in the grocery store) and tie the legs. Bake the chicken at 425 degrees for about 1 hour and 15 minutes. You'll know it's done when the juices that run out of the chicken are clear. The best place to test this is between the leg and the thigh. Once it's done, remove from the oven and "tent" foil over it to retain the heat. Let it stand like this for 10 minutes. Once it's done, you're left with a beautifully browned chicken. If you're entertaining, you could put the entire chicken on a platter and cut it at the table. If it's just a normal Sunday night, I recommend cutting it on a platter with a groove on the sides to catch the juices. No one wants chicken juice all over their kitchen. Start by removing the wings, then the drumsticks and thighs (which are below the drumsticks). Then you can slice off the breast. Then it's time to enjoy it with your favorite sides! And get ready to make it again soon, because this is sure to be a new go-to recipe. Line a medium roasting pan with aluminum foil and spray with cooking spray. Remove the giblets from the inside of the chicken, rinse the chicken, and pat dry with paper towel. Place the chicken in the roasting pan and rub with olive oil. Sprinkle generously with salt and pepper. Stuff the lemon and garlic in the cavity of the chicken and tie the legs with cooking twine. Place the chicken in the oven and bake for approximately 1 hour and 15 minutes, or until the juices are clear when the chicken is pierced with a knife. Remove from the oven and tent with aluminum foil for 10 minutes. Carve and serve.